Cheesecake on a stick! How fun is that? I love cheesecake any way I can get it and few desserts in this world capture my imagination more than a rich, luscious, baked cheesecake. If I order dessert in a restaurant, it’s likely to be cheesecake, and I love sampling all the flavors at The Cheesecake Factory. But I do have a dirty little secret to share…I haven’t made one in several years (which is why you’ve never seen one on this blog) because I have no self control when it comes to cheesecake. If I make a cheesecake, especially one with booze or tricked out with all sorts of extra yummies like chocolate and caramel, you might as well slap a “Wide Load” sign on my behind because I’m done for. I did eventually realize I could make a full size batch but bake it in mini or half-size pans or muffin tins and freeze the extra or share with friends, and that helped my addiction. Somewhat. I knew The Daring Bakers would eventually tackle cheesecakes in some form, and I got very excited when I saw this month’s challenge was cheesecake pops because they were a perfect mini size and they are so adorable! Of course we had to follow all the regular rules, but as always we were given some leeway for creativity. We could substitute another flavor for the vanilla extract and we could use whatever type of chocolate and decorations we liked. 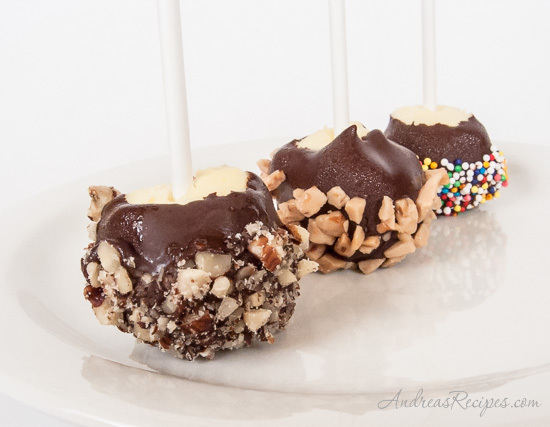 The pops just had to be made with the basic cheesecake recipe, rolled into 2-ounce balls, dipped in chocolate, and served on a stick. For my variations, I chose to flavor the cheesecake with Kahlua and rolled the coated pops in hazelnuts, toffee bits, and even sprinkles just for the kids. 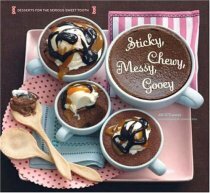 The recipe comes from Sticky, Chewy, Messy, Gooey, a fun dessert book by Jill O’Connor. I shared the pops with all the neighbors at an impromptu pizza party out in the cul-de-sac one evening last week and they were a hit. As expected, all the kids wanted the pops with sprinkles! I was pretty confident going into this challenge since I had plenty of cheesecake experience under my belt, but I did know some bakers had said the cake would not set up, and as it turns out I had the same problem. You would think after a year in this house I would have the oven figured out already, but it still keeps me guessing. My oven thermometer says the oven is accurate but it almost always takes the maximum suggested time to cook anything, often more, and this baby was definitely not ready after 45 minutes. I pulled it out when it looked like the edges were getting a little too done, though the middle looked appropriately wobbly. I let it cool completely and chilled it before attempting to scoop, but it was still loose in the middle, though not runny. I had to work fast while rolling the balls and I popped them into the freezer right away with the sticks already in. They sat in there for about 24 hours before I had a chance to go back to them, so they were well frozen. For the chocolate I used Ghirardelli Bittersweet chips. I had planned to add some espresso powder in the chocolate to carry on the coffee theme, but I forgot, so I’ll have to try that next time. I should have enrobed the balls in chocolate all the way up to the stick, but I wasn’t thinking clearly late at night when I finished these up. With the chocolate clinging to the stick, that would have helped keep the balls in place while eating. After coating all the pops, I put them back in the freezer, and we ate them frozen. We really liked them frozen as it was like eating a really rich popsicle. One thing I definitely did wrong was estimating the proper size. The recipe states 2-ounces of cheesecake for each pop, and I thought my #60 scoop (small, 2 teaspoons) would be just right, but I realized that was not so when I had 32 balls on the tray and half the cheesecake left! As it turns out we liked the small size for such a rich dessert, though next time I might use the #40 scoop (medium, 1-1/2 tablespoons) instead. That might be just a bit smaller than called for, but close enough. So now that I had all this cheesecake leftover I had to decide what to do with it! I finished scooping it all out with the #60 scoop and put them into mini muffin pans, then covered them with plastic wrap and foil. They are sitting in my freezer waiting for another opportunity to enjoy cheesecake pops, or even a cheesecake sundae! I made fudge sauce from more of the Ghirardelli chocolate and heavy cream, then floated a frozen cheesecake ball on it and sprinkled crushed hazelnuts and toffee bits on top. Oh, was that heavenly! Thanks to Elle of Feeding My Enthusiasms and Deborah of Taste and Tell for choosing such a fun and delicious challenge for us! To see all the other cheesecake pops, head on over to The Daring Bakers Blogroll. If you have never made a cheesecake before, I highly recommend an article called Perfect Cheesecakes written by the staff at Allrecipes. It’s full of great tips. 1. CHEESECAKE: Position oven rack in the middle of the oven and preheat to 325° F. Set some water to boil. 2. In the bowl of the stand mixer, beat together the cream cheese, sugar, flour, and salt on low speed until smooth. Add the whole eggs and the egg yolks, one at a time, beating well (but still at low speed) after each addition. Beat in the vanilla and cream. 4. Remove the cheesecake from the water bath and cool to room temperature. Cover the cheesecake with plastic wrap and refrigerate until very cold, at least 3 hours or overnight. 5. 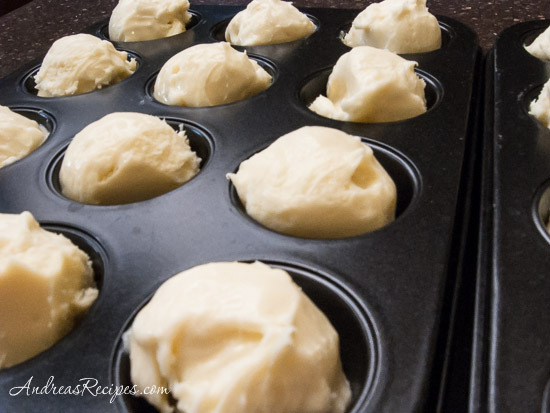 MAKE THE BALLS: When the cheesecake is cold and very firm, scoop the cheesecake into 2-ounce balls and place on the wax paper-lined baking sheet. Carefully insert a lollipop stick into each cheesecake ball. Freeze the cheesecake pops, uncovered, until very hard, at least 1 to 2 hours. 6. CHOCOLATE: When the cheesecake pops are frozen and ready for dipping, prepare the chocolate using the stovetop method or the microwave method. STOVETOP: In the top of a double boiler, set over simmering water, or in a heatproof bowl set over a pot of simmering water, heat half the chocolate and half the shortening, stirring often, until chocolate is melted and chocolate and shortening are combined. Stir until completely smooth. Do not heat the chocolate too much or your chocolate will lose it’s shine after it has dried. Save the rest of the chocolate and shortening for later dipping, or use another type of chocolate for variety. MICROWAVE: Put half the chocolate and half the shortening in the glass bowl. Microwave on high at 30 second intervals, stirring until smooth. 7. Dip a frozen cheesecake pop in the melted chocolate, swirling quickly to coat it completely. Shake off any excess into the melted chocolate. Roll the pops quickly in the decorations. You can also drizzle them with a contrasting color of melted chocolate (dark chocolate drizzled over milk chocolate or white chocolate over dark chocolate, etc.) Place the pop on a clean wax paper-lined baking sheet to set. Repeat with remaining pops, melting more chocolate and shortening as needed. 8. Refrigerate or freeze the pops for up to 24 hours, until ready to serve. Chocolate – Use all one kind or half and half of dark, milk, or white. You can also use 1 pound of flavored coatings, also known as summer coating, confectionary coating, or wafer chocolate. Candy supply stores carry colors, as well as the three kinds of chocolate. Your cheesecake pops turned out great! Congrats! Wow! Beautiful pops! Seeing all those yummy looking cheesecakes makes me wish I had a few hidden away in the freezer still! 🙂 Great job! Great job on this challenge – they look absolutely wonderful! Great job on the challenge, they look divine. Love that you spiked the batter! I bet they are delicious! Your pops look beautiful! I loved this challenge. They were really tasty! aweome! I love what you did. Ill take that cheescake sundae you have going on there! Great job and I’m sure the boys loved it. Wonderful cheesecake pops. 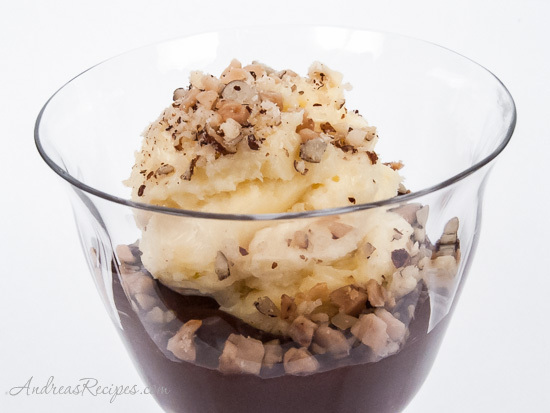 And my heart just did a somersault upon reading the fudge sauce on cheesecake….now that is a delicious idea! Wow your pops are really cool. I can’t wait to look at the rest of your site! Kahlua and toffee bits — I’m in! The sundae is brilliant also. Kahlua, hazelnuts, fudge sauce . . . It seems endless variety is ours Andrea! Great idea to put them in the minimuffin tins! Beautiful. This is such a great way to serve cheese cake in my book. Just the right size! Lovely looking pops, and lucky (or unlucky) you to have so much cheesecake left to enjoy. They look great and the flavors sound delicious! Great job! You are such a talented cook! I wish I had thought of the crushed toffee and your idea of uses for the leftover balls. . .genius! I love the sundae with the crushed hazelnuts! Well, my parents are coming a long ways to be with all of us kids over the 4th of July and I am going to use a few of your ideas for the cheesecake pops. . .=D. Kahlua cheesecake, yum! Your pops turned out great! I don’t think it was your oven, Andrea, but the recipe itself. Afterall, look how many of us had the same issue? The toffee and nuts sound wonderful with the cheesecake. Yummy. I like what you did with the leftover cheescake…kinda likea deconstructed cheeseypop…. Love the idea of a Kahlua cheesecake and the cheesecake sundae looks best of all! Delicious job! I love the addition of kahlua in the cheesecake pops. YUM! love all the various topping ideas you used! Oh my gosh! I thought I was craving cheesecake today after seeing all the pops, but your cheesecake sundaes are over the top! Yum!!! Pretty pretty…very nice Andrea. Love the flavours & also love the way you used the mini muffin tray! The floaters in the sundae are killers…would die for them!! Great challenge! I agree with you on the not able to resist issue. I’ve had two today and so far, we like them better frozen than right from the fridge. I’m glad I halved the recipe because I don’t have a cul-de-sac full of kids to share with. But that sounds like a lot of fun! Your pops are great, and I don’t think they need to be covered right up to the stick. Yum! Kalua and hazlenuts! That sounds terrific! I can’t stop my cheesecake addiction by freezing it because I happen to love frozen cheesecake just as much… it’s a problem! Your pops look great! I could go for that fudge cheesecake sundae. Yummy! I hear you on the cheesecake addiction! I’m about ready to padlock my fridge right now. I can’t stay away from those pops! Thank goodness tomorrow I’ll be bringing some to work. I love your idea to flavor your with Kahlua. That must have been delicious. They look great! Great looking pops! Very well done! Espresso with the chocolate would have been an amazing combination. Your cheesecake pops look delicious anyway, though! ps. I, too, am addicted the the cheesecakes at the CCF! Thanks for showing the cover of the book! I’m sorry your cheesecake didn’t set properly but what you finally did with it really looks amazingly delicious! Ok trying to get this to work (3d attempt) afraid you’re going to end up with 3 comments! Love that first photo Andrea, and that last one…have to remember! I *love* the idea of using a Kahlua glaze – bet that tasted great with the nuts! Yowza! I thought these pops were pretty fantastic the way they were – but I am blown away by the cheesecake ball sundae!! Yum! I love the sundae idea. Now I wish my pops weren’t all eaten up. Kahula – I do not think I have had that in years!!! These pops look great! They are simply lovely… and looks oh so yummy! Those look great Andrea – nice job! Whoa, those sound so yummy! Great job! Andrea these look great. I love the way you served them in the last shot. I *love* your floating cheesecake ball! 🙂 Great job with April’s challenge! Wow! Yours are so nice! How wonderful that you shared them with the neighbors. I love the Kalua idea. Darnit, why didn’t I think of that?!?! I vote cheesecake sundae. You know, as if you asked 🙂 Your blog is really nice – I need to spend a little time here! Oooh, frozen cheesecake! Wish I’d thought of keeping a couple set aside for that. You did a wonderful job on your cheesecake pops! They came out so well, and they must have tasted really good 🙂 Well done. Yum, toffee and nuts. good job. Sounds like a great combination and your pops look lovely! Excellent job, Andrea. Cheesecake sundaes! Yummy! I love that you used toffee bits.